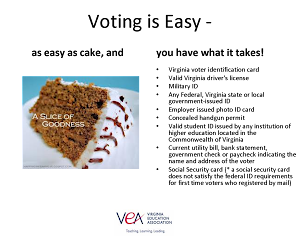 Student Virginia Education Association: George Mason University SVEA Reactivated! George Mason University SVEA Reactivated! The GMU Chapter SVEA had their first organizing meeting in May 2012 with Tami Sober (VEA Staff). The newly activated chapter generated ideas of organizing, recruitment, and activities.The Manassas Education Association, Fairfax Education Association, and Prince William Education will assist the chapter and foster a partnership. President Forkell states "George Mason's SVEA is starting off and cannot wait for the Fall 2012 semester! We are especially excited to work closely with the NVCC SVEA chapter since we are close and can involve the community. Our new members and board are very motivated to start reaching out to more students and our community. We are thinking outside of the box and cannot wait to be more involved!" ACT NOW TO KEEP THE AMERICAN DREAM!